Indiana played an important role during the American Civil War. During the course of the war, Indiana contributed approximately 210,000 soldiers and millions of dollars of horses, food and supplies to the U.S. Army. Hoosiers served in every major engagement of the war and almost every engagement – minor or otherwise – in the western theater of the war. As an agriculturally rich state containing the fifth-highest population in the Union and sixth-highest of all states, Indiana was critical to Northern success. The Sons of Union Veterans of the Civil War seek to preserve the legacy of those Civil War heroes who fought to save the Union. 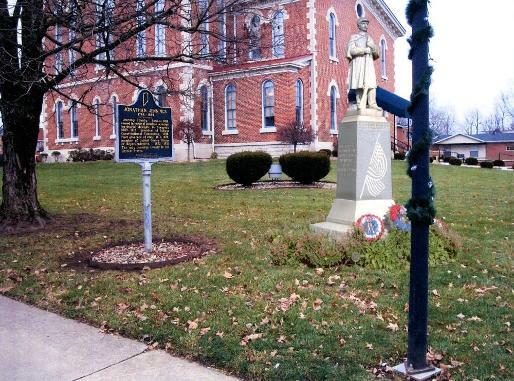 We have set in motion plans to erect a monument in Jennings County and one in Bartholomew County. Below you will find PowerPoint presentations of our proposals. If you would like to support the project by helping with fund raising or by making a donation, please contact an SUVCW 223 member or the Jennings County Community Foundation at their website (www.jenningsfoundation.net).